Count Von Count would have a vonderful time counting at Christmas and holiday time. Try some Christmas counting fun for kids and count the smiles. Counting can happen with anything and at any time. Just think of how many times in a day that you count. Change for parking, the number of errands to do, places to set at the table, minutes left for food to cook, and the right number of kids at the door. It happens so often for adults we don’t even notice. Kids need countless many, many opportunities to count. Quite young toddlers will say the names for the numbers. 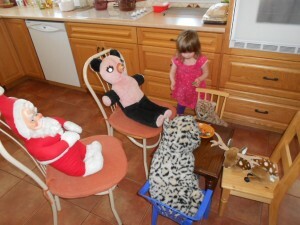 The words won’t yet be in order but kids are building their familiarity with them. Just like first steps are a little unsteady, so is counting. Even once kids can say the numbers in order, this doesn’t indicate that kids are actually counting. In order to count, a child has to figure out that each number means one item. We might think math is all about numbers, but really it’s all about relationships. 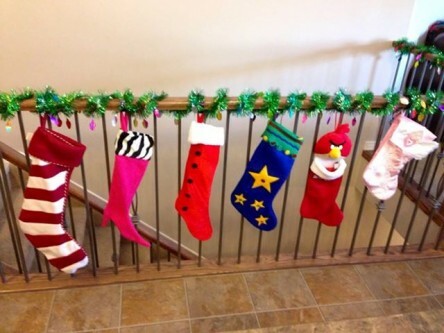 Instead of candy canes, sing about 10 little stockings hanging up, 10 little Christmas gifts, or 10 little busy elfs. Counting is also a good strategy for tidying up. Ask your child to put away 10 toys in the toy box. You can get the numbers mixed up and have to do it again and put away some more toys. The sillier the better so it’s still fun. What else counts for Christmas counting fun for kids? Both adults and children can and do suffer from math anxiety. Having fun can help develop math confidence. Does your family play any math games for kids? 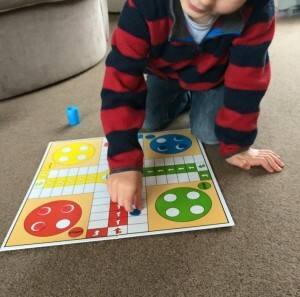 Here a few games that we can play with kids and they can learn to do by themselves. Please note, learning to use rules takes patience on our part. 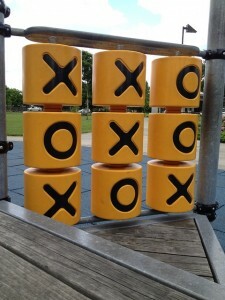 One of the oldest games is Tic Tac Toe. It’s been around for over 2,000 years. There are magnetic and digital versions for playing in the car, and some big enough for playgrounds. Anything can be used for the x’s and the o’s, from dinosaurs to fruit loops but it’s hard not to eat the o’s. This game can’t be played alone, it needs a partner. 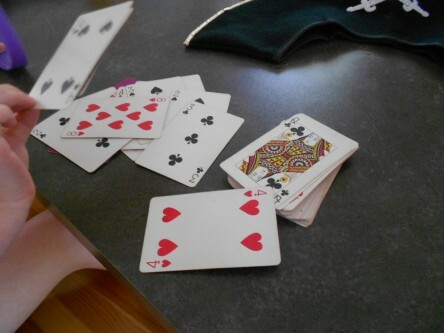 Cards can be used for several simple games. Before kids learn to count, kids and adults can turn cards over to see if they match. For young toddlers, you can use the numbers 1 to 5. A favorite came is War, where the person with the higher number takes the other person’s stack. Go Fish is another popular game for making pairs. 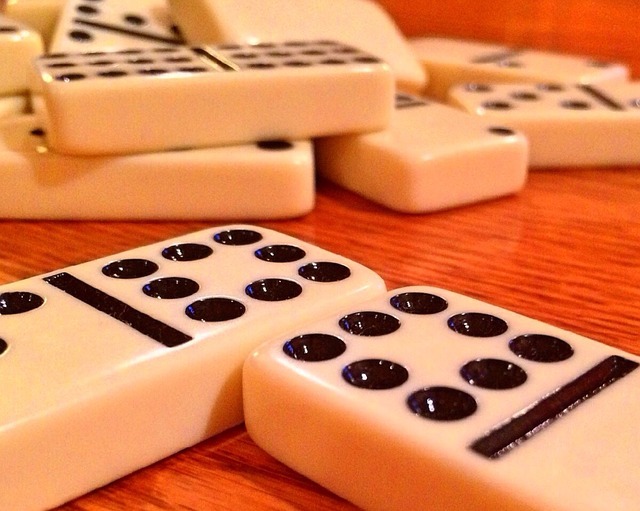 Dominoes are more fun for making lines that topple but the game is played in many countries of the world by matching the number of dots on one section to the same number on another piece. Dice can be small, big or giant sized. Most dice have dots for 1-6 and are used as part of other games. Board games are another fun way to include some math fun for kids and families. Passionate About Play shared this photo on Facebook recently, along with a funny commentary of what else can happen when playing games with kids. Do you remember playing any? Snakes and Ladders is played around the world. 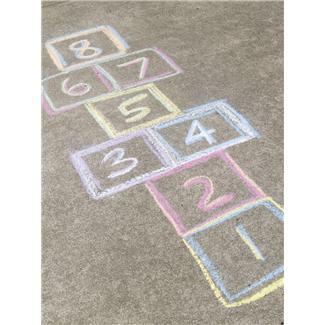 For some outside fun, show kids how to draw hopscotch on a sidewalk or driveway. This can be played by one person alone or by several. 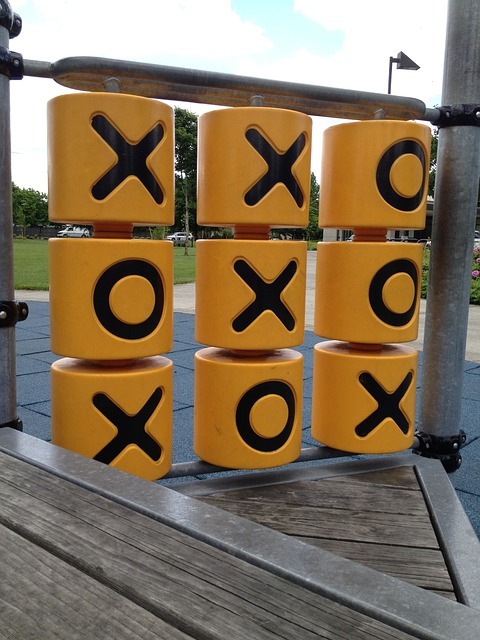 Kids can have fun jumping in the squares before they figure out the numbers. The record for the longest hopscotch in the world is held by Detroit for one almost 4 miles long! Usually, hopscotches are somewhere between 10 and 20 squares. There are many other games for kids and families. Have you seen the video of a grandpa and grandson playing one that uses a spinner and a plastic hand loaded with whipped cream? There’s lots of counting and laughing in this game. As parents and caregivers, we so need to make sure math is fun for kids. Use it every day so kids feel it is part of their lives. Do you have some math games for kids and families? Math fun for kids does not mean parents need to be math experts. 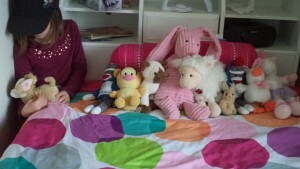 Math happens in every room in the house, even children’s bedrooms. Did you know that you and your child are doing math naturally even when getting dressed? Math starts the day for parents and kids with the time on the clock but this isn’t always fun, so let’s skip that bit of the day. How many beds are in the room and how many kids? Does 1 child have 1 bed? This is called one-to-one matching and it’s an important concept for numbers. Kids need to learn that 1 number goes with 1 thing. If there were 2 kids how many beds would there be? How about for 10 kids? That question can get sillier. How many for 100 kids? Or, maybe 1000? 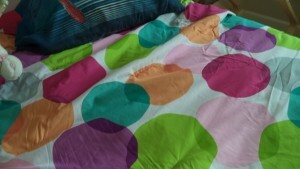 Does the bed cover have a design on it? There could be some shapes like circles, triangles, squares, and rectangles. One way to look for shapes is to play “I Spy.” This is a game that can be played over and over and sometimes helps keep a child still for getting dressed. Eyes can move while bodies stay in one place. Clothes often have shapes and patterns. As the pajamas get changed for day clothes, look for patterns. Brains love patterns because patterns are a way of condensing information and making it more predictable. Sometimes clothes have buttons. You and your child can count the buttons on a shirt or maybe count toes before they go in a sock. Clothes come in different sizes. Parents often comment that something is too big and needs to get rolled up or that it’s getting too small and barely fits. When we talk about sizes, we’re using math. 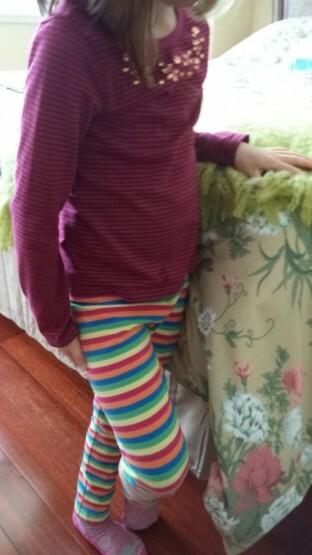 If the morning isn’t too rushed, you can try and put on a child t-shirt or sock. Sizes can be pretty funny. At the end of the day, tossing the dirty clothes in the laundry basket is a way of making groups. We don’t think of it, but making groups is another math concept. That’s only a little bit of the math fun for kids that can happen in the bedroom. Often, bedrooms have toys and books too but we’ll save that for another day. 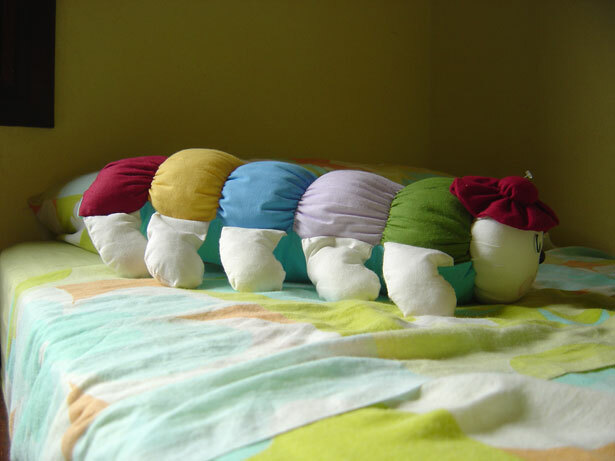 Hmm… do you hear anybody singing 5 Little Monkeys or 10 In The Bed?